SCVHistory.com LW3055 | Agua Dulce | Vasquez Rocks, 1960s. 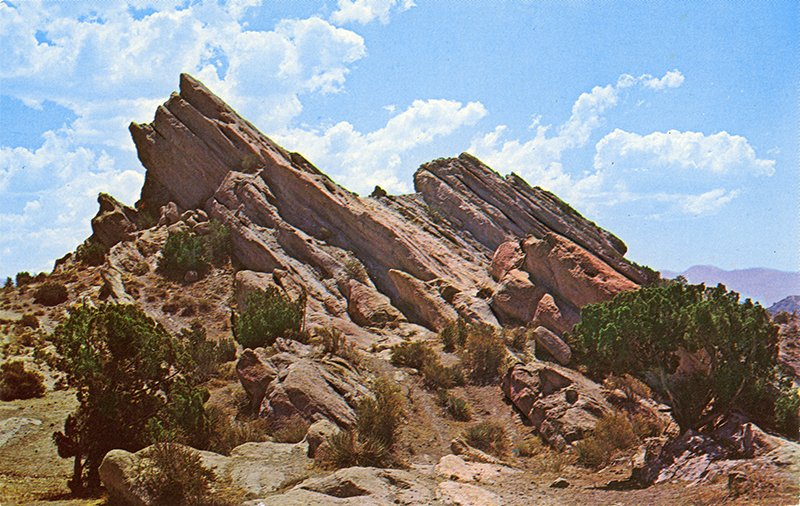 Vasquez Rocks County Park in Agua Dulce, 1960s. Unused "Plastichrome" postcard by Colorpicture Publishers Inc. of Boston, distributed by Inland Distributing Co., 44221 Date St., Lancaster, Calif. 93534. The postcard is undated, but the information on the back tells us when it was published. Colorpicture started in 1938 with linen postcards and began publishing photochromes under the Plastichrome brand name in the 1950s. 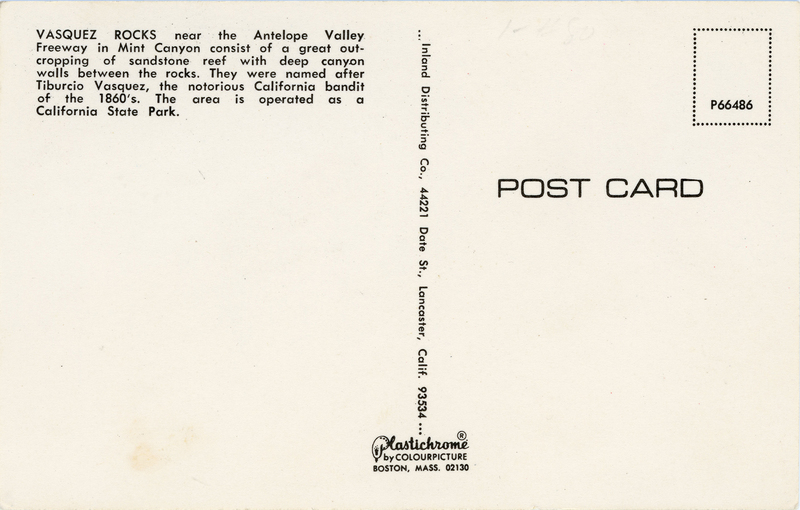 But this postcard can't date to the 1950s because it mentions the Antelope Valley "Freeway." The first section of the freeway opened in August 1963. And it can't date later than 1969, because that is when Colorpicture went out of business. So we can narrow the date to 1963-1969. Vasquez Rocks near the Antelope Valley Freeway in Mint Canyon consist of a great outcropping of sandstone reef with deep canyon walls between the rocks. They were named after Tiburcio Vasquez, the notorious California bandit of the 1860s. The area is operated as a California State Park [sic; s/b Los Angeles County park]. Vasquez Rocks, now a county park, are located in the northeastern Santa Clarita Valley area of Agua Dulce, off of State Route 14 (Escondido Canyon Road exit). They derive their name from 19th-century outlaw Tiburcio Vasquez. Millions of years before Vasquez, the rocks were thrust up from the ocean floor by earthquakes and volcanic forces. Over time the upheaval was so great that the rocks actually moved up and over: What is now the top surface, once was the bottom. Some 3,500 years ago, and lasting until the early 1800s, the rocks were an important crossroads of north-south and east-west trading routes. The area was first occupied by ancestors of the Chumash and later by the Tataviam Indians (related linguistically to the Shoshone), who arrived around AD 450. Tataviam spiritual leaders practiced a form of shamanism and left paintings on the rocks to depict visions inspired by their incantations Among the paintings are volcanos, suns, human shapes, lizards and other creatures. Sometime in 1871 Tiburcio Vasquez, the so-called "Scourge of California," stared using the craggy rocks as a hideout. Vasquez was born April 10, 1835* in Monterey. By 20 he was rustling cattle and robbing freight wagons. It is reported that Vasquez would occasionally ride into Newhall and steal horses while holed up at Vasquez Rocks. His exploits, which took him the length of California and rivaled those of the more famous Joaquin Murietta (California's first real outlaw), reached a peak in 1873 when Vasquez and his men raided the town of Tres Pinos, killing three, then ransacked the town of Kingston, tying up its residents. With an $8,000 price on his head, Vasquez was captured May 14, 1874 at the ranch of a friend, the prominent Southland freighter "Greek" George Allen (today Allen's ranch is the Hollywood Bowl). Behind bars in Los Angeles, Vasquez provided clothes for use in a stage play about his life, then was transported to San Jose where he was convicted of murderng an innkeeper during the Tres Pinos "outrage." He was hanged at 1:35 p.m. March 19, 1875. His last word was "Pronto." * Not August 11. See Boessenecker 2010:13. LW3055: 9600 dpi jpeg from original photograph purchased by Leon Worden.